Steve G. Jones, Ed.D., Clinical Hypnotherapist, charges $1,500 for a custom recording and $25,000 for a one-hour private hypnotherapy session at his office, but you can get all the benefits for this low price. Simply listen to the Natural Childbirth Hypnosis MP3 download every night as you go to bed for three weeks and feel the changes happening in your life. You will feel more empowered, more in touch with your true self, and you will truly know that your goals are within your reach. to giving birth. It’s easier than you think. … don’t wait, do it NOW !!! you’ll be glad you did. See you at the top! And as you continue to relax you realize just how healthy your child is. As your child continues to grow and to develop within you, feel yourself sending loving, cleansing, pure energy, loving, cleansing, pure energy, pure energy to your child. And I would like you now to imagine that day, that beautiful day when you will give birth to your child. Imagine the surroundings. You have chosen a natural child birth because you are very enlightened. And as you imagine yourself there on that special, beautiful day, see yourself relax, see yourself completely at ease. See yourself happy, ready to give birth to a beautiful, healthy child. I would like you now to imagine that in your mind there is a switch. And this switch can be in the on or off position. When it is in the on position, you allow yourself to feel those situations from every part of your body. When it is in the off position, you no longer feel those sensations. Those sensations for you do not exist. And as you see yourself now on that special day, realize that you have the power at any time to turn that switch off and no longer feel those sensations. You have this option, this power, this control, so if at any time you would like to eliminate those sensations coming from your body, you realize that you can turn the switch off and immediately eliminate those sensations. I would like for you now to take this opportunity to practice using this switch, that’s right. Turning the switch off now, realizing that those sensations from your body have gone away. And as you now turn the switch on, those sensations come back, that’s right. And as you continue to practice this technique, you will become better and better at it day by day so that by the time you have your child, it will be a beautiful experience and if there are any associated sensations which you want to block, you will be able to block them instantly by turning that switch off. And now as you continue to focus on that beautiful day, see yourself relaxed. See yourself free from pain. You are relaxed. See yourself smiling, just enjoying this beautiful experience which you have properly prepared for. And now see the baby being born, that beautiful part of you entering the world. That beautiful individual entering a life. You are so relaxed and you see yourself smiling as the baby leaves your body easily and peacefully and effortlessly. You are so relaxed and smiling, so relaxed and at ease. You now see yourself holding your beautiful wonderful baby and smiling. And see your baby smiling back at you. There is an understanding between the two of you. You are relaxed. And if there are any loved ones in the room, see them sharing their love now with you and with the beautiful new life you hold in your arms. And you now continue to relax. This powerful Natural Childbirth Hypnosis MP3 session will prepare you to have a natural child birth when delivering your child. Hypnotherapy is a great way to accomplish your goal of having a natural birth. 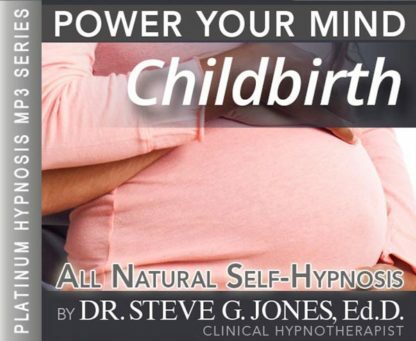 You can experience natural child birth pain-free with hypnosis. While using this natural childbirth hypnosis session you will be visualizing your birth and you will imagine it going very easy and smoothly. Hypnotherapy will prepare you to cope with the pain and discomfort of the birth. Giving birth to a child is a wonderful event that will forever bond you to your child. Having a natural birth will allow you to have the full experience of the beautiful birth of your child. We suggest you listen to this Natural Childbirth Hypnosis MP3 recording every night before bed for 21 nights. It will also prepare you for the child birth if you continue to listen to the self-hypnosis recording on a consistent basis throughout the rest of your pregnancy.